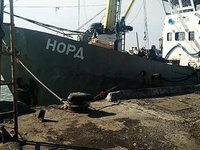 Captain of the Nord fishing vessel Voloydymyr Horbenko, a Ukrainian citizen, has disappeared, his lawyer Maksym Mohylnytsky has said. The Nord was detained by Ukraine's State Border agents in March 2018. "Volodymyr Horbenko went missing. According to the relatives, last Saturday around noon, Volodymyr disappeared from home and no one has seen him since. The captain does not contact the family and the lawyers," the lawyer said on Facebook on Monday, noting there are grounds for concern. "We are very worried," the lawyer said, adding that he does not exclude provocations by law-enforcement agencies or members of radical organizations. Mohylnytsky said he hoped the captain is alive and well. As earlier reported, on March 25, 2018, Ukraine's State Border Service of Ukraine detained the Nord with 10 crew members on board. Horbenko was served with a notice of suspicion under Article 332-1 of Ukraine's Criminal Code (violation of the procedure for entry/exit into the occupied territory of Ukraine in order to harm the interests of the country). Later, he was served a notice of suspicion under Article.249 (illegal fishing). The Kherson city court chose a measure of restraint in the form of personal recognizance. At the time of the pretrial investigation, Horbenko stayed with relatives in Melitopol, Zaporozhia region. On June 19, the Kherson city court refused to renew the obligation for Horbenko not to visit the territory of the Autonomous Republic of Crimea. On January 10, 2019, Kyiv's Obolonsky District Court postponed the preparatory meeting for Horbenko's trial until February 1, 2019.